This summer I am at home in Chivhu, Zimbabwe, implementing a sewing project, which we named A step toward hope— Education and self reliance. With the help of a local teacher, my family, and various community members, we are teaching 16 primary-age children how to sew. In addition to that we are also teaching them business skills as well as fostering a good environment for friendship making. Poverty is a major threat to peace in my village, and the main aim of this project is to alleviate the effects of poverty and to make sure the children stay in school. We hope that at the end of the day, the children can competently take care of themselves as well as help others in need. Prior to the start of the project in mid-June, there was great interest in taking part in the project. 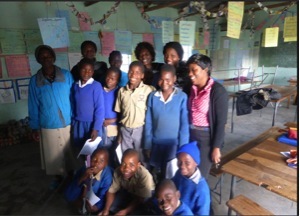 To my chagrin, the headmistress of Chivhu Primary had already identified and recommended more than 70 students who could benefit from it. These children come from low-income families and more than half of them were orphaned. This situation was really hard since at most we could only accommodate 15 children. We eventually decided to choose the children based on academic skill, and also weighing who had the most probability of dropping out of school. We ended up with 16 of the least academically gifted children in the reasoning that they will be able to sustain themselves in the event that they fail in school. Four of these were currently not in school at all. Thus began visits to their respective families, numerous introductions to teachers and eventually the launching of the sewing project on June 15th, which we hope will change these children’s lives forever. 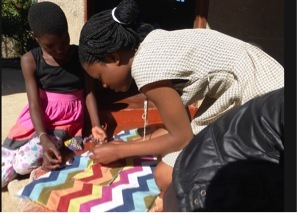 Very shy and timid at first, the children struggled to grasp the sewing concepts, but now, four weeks after we began, and with the firm helping hand of Mrs. Mubako, our home economics teacher, they have blossomed like flowers and are just done making sewing bags. In addition to teaching them sewing skills, we take the first thirty minutes in our Friday meeting to introduce to them a professional in our area who gives a short talk about their careers. We have also allowed community members to listen in on these talks, for their benefit. The community response has been very positive and local businesses have chipped in to support the cause of this project. We hope to cultivate self-reliant skills in our children as well as teaching them to love and look out for each other. We also aim that in taking part they will learn independence, and self-confidence too, for most of the children have been looked down upon, because of their backgrounds and quite weak academic skills. It is my sincere prayer that this project continues on its path of success. Not only is it changing the lives of these children, but also paving way for similar projects in our area. 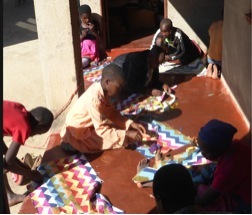 In 2 of the photos some of the children work on the veranda floor because we cannot all have tables to work on. The first photo is my first week with some participants, 2 parents and teachers.